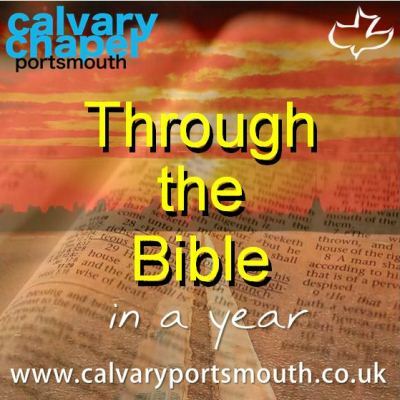 This study, taught by Pastor Barry Forder, is the 40th session of our ‘Through-the-Bible-in-a-Year’ series recorded during 2014 as part of our Sunday morning family services. In this study we review Paul’s letters to the Galatians and Ephesians. Paul’s letter to the fellowship he had started at in Galatia was to find out why a church that had started so well, and now been blown off course? These gentile believers had received the gospel, and believed, solely on the basis of grace. There was nothing that could be added to the completed work of Christ. However, there had arisen a problem regarding the Law of Moses, and now many in the church were trying to keep the Law. Paul systematically shows them that the Law is perfect, it states God’s righteous standard – a standard that none can meet! The Law shows us our true nature before a holy God, our desperate condition, and so it becomes a school master to lead us (lit. forces us to flee) to Christ (3:24) as the only means whereby we can be saved. The Law could not save us, it simply condemns us. To desire to keep the Law, to be back under the Law, is to be back under condemnation, seeking to be righteous by your own efforts, where Christ can profit you nothing (5:4). The question is then asked, by what rule shall we live? By walking in the Spirit (5:16-26). Ch 1 – Who we are – God’s chosen, to the praise of His glory (1:5,12). Ch 2 – Where we’ve come from – Dead in sin, hopeless, helpless, outcasts (2:1). Ch 3 – Where we’re going – Eternal destiny as one body united in Christ (3:11). Ch 4 – What we should be doing – Walking worthy of our calling, renewed in our minds (4:1). Ch 5 – Why we should be doing it – Because of the promise of our inheritance, and the reality of the coming Judgment (5:1). Chapter 6 – How we are to do it – In the power of His might (6:10).